Give someone (or YOURSELF) the gift of design. Our Style Sessions are an extremely popular option for clients who are interested in working with a professional designer and getting verbal feedback on projects throughout their home. This one-time session provides up to 2 hours of one-on-one time with Ruxana Oosman in your home or office. 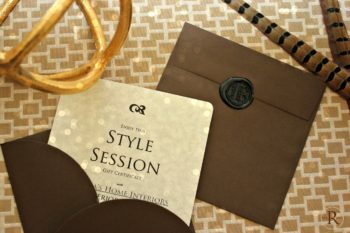 It includes several instrumental resources to help you complete your projects quickly and keep your momentum.This Gift Certificate comes elegantly wrapped and will be mailed directly to your recipient along with a useful cotton tote bag, a chic decorating journal and coordinating pen. Thirty minutes (30 min) of travel time is included. Travel fees will apply for additional travel time.